Dzumhur leads the H2H 2-1, but Cecchinato won their only meeting on clay at Bucharest in 2016 (recent meeting as well). Though both players prefer playing on the clay courts and the Bosnian has more qualities as a player than the Italian, his current fitness issues make this an even contest. Damir Dzumhur ended his three-match losing run with a straight-set win over Norbert Gombos in the first rubber of the Davis Cup Group One tie earlier this month. Though he lost the fourth rubber to Martin Klizan, Bosnia/Herzegovina managed to seal the tie, 3-2. The two singles rubbers that he played in the Davis Cup (indoor clay) was his first match on clay this season. Dzumhur played 25 matches on this surface in 2017 and won 14 of them (14/11), including winning the title at Blois Challenger and finishing as the runner up at Santo Domingo challenger. This is Damir Dzumhur’s third consecutive appearance in Monte Carlo and first as a direct entrant into the main draw. He defeated the likes of Tomas Berdych and Robin Haase here in 2016 (won four matches) before losing to Milos Raonic in the round of 16 (three-setter). Dzumhur, who was forced to retire six times in the last two seasons, has already retired twice in 2018, at Sydney (left hamstring) and Marseille (illness). 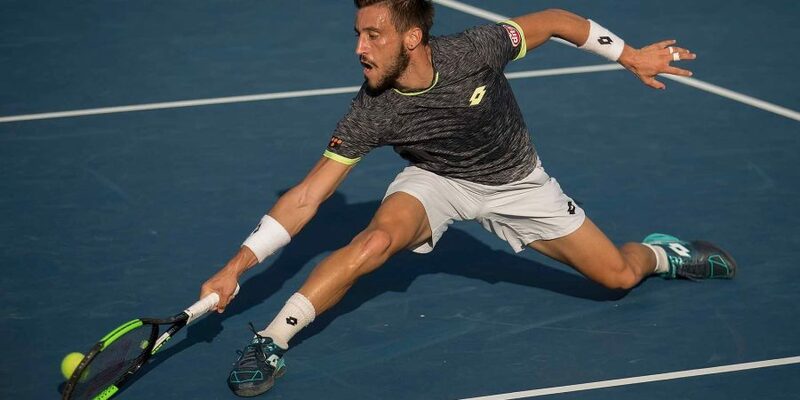 Since his recent retirement (vs. Tomas Berdych at Marseille), Dzumhur has played four matches on tour and lost three of them, with the only win coming against Yannick Maden in Dubai (wasn’t convincing during that match as well). Like Dzumhur, Marco Cecchinato made his Monte Carlo debut in 2016 and lost to the same opponent (Milos Raonic) who knocked out the Bosnian but in the very first round. The Italian has recorded an impressive 18 match-wins in 2018 with 17 of the coming on clay. Very recently, he made three consecutive semifinal appearances in Santiago Challenger (F), Marbella Challenger (SF) and Alicante Challenger (SF). Playing at the Barletta Challenger last week, Cecchinato put in a poor performance during the first round loss against Nikola Milojevic, 6-3 7-5. That defeat was always on the cards as he had to enter the Monte Carlo qualifiers in the same week.